How high are realtors' and lawyers' fees in Slovakia? What about other property purchase costs? 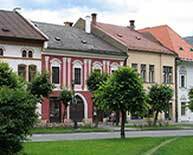 There are no legal restrictions on foreigners buying buildings in Slovakia. With the inclusion of Slovakia to EU this 2004, the restriction on foreign ownership of land has been lifted, except for agricultural and forest land. Apartments and flats range from studios (usually with a small hallway, a single room and a kitchenette) to multiple bedroom flats and penthouses. Usually, properties are referred to not by the number of bedrooms but by the number of rooms (a 3-room flat would be the equivalent of a flat with two bedrooms and a living room). Once a property has been chosen, the buyer is expected to pay a 10% of the purchase price as deposit to secure the property and for the legal processes to commence. At this time, the pre-purchase agreement is signed between parties. In case the buyer changed his mind after making the deposit, he is then responsible to pay for any expenses incurred by the agent. This is done by deducting the expenses incurred by the agent from the deposit and the balance is given back to the buyer. In the case the seller changed his mind, he is responsible to pay any expenses incurred by the agent and the deposit is fully returned to the buyer. Next step of the process is the preparation of the property report by a surveyor, who then furnishes a copy to the solicitor so that the latter can now prepare the final contract. The contract is then signed by both parties, and the buyer now pays the balance to the seller. The Cadastral Register (katasternehnutelnosti) discloses the property owner, and indicates the extent to which the land is encumbered with mortgages and other forms of legal servitudes. Currently, all Slovak agencies require the seller to provide a Kataster paper that contains the legal state of the property before selling. The paper cannot be older than three months to safeguard the buyer from any legal disputes. It is advisable that the buyer requests a copy of this paper before paying the rest of the balance. The title deeds are then transferred to the buyer's name after a period of four weeks. Notaries are not necessary before registry . Real estate agent's commission range from 3% to 6% with cheaper properties attracting higher fees. Notary is not required to establish certain real estate rights. However, a notary public or local municipality usually certifies the signatures of transferors in such legal agreements. The standard VAT rate is 20%. The transfer of real estate is VAT-exempt, except for transfers made within five years of the official completion of the construction. Transfers of land, except building land, are not subject to VAT. How landlord-friendly is the law in Slovakia?